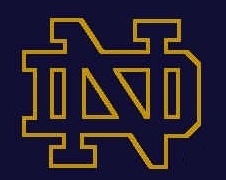 By now you have probably heard that Notre Dame has a new shoe and apparel contract with Under Armour. While the contract is apparently the most valuable in college sports history, I am impressed with Notre Dame’s ability to maintain its identity. I am aware that the negotiating position of each school is different in terms of how much leverage they have, and Notre Dame has more leverage than most. However, with so many schools selling their traditions and histories in order to “better” their competitive standing, it is refreshing to see a school so committed to maintaining a non-commercialized atmosphere. One point in the talks that was not negotiable was Under Armour getting any signage in Notre Dame Stadium. “It’s just one of those things that is just so central to our identity,” Swarbrick said. “We want to be Augusta-like in that way, and that’s why after we discussed it one time it was never brought up in conversation again. I also stumbled upon the following quote from an article in the Chicago Tribune. The stadium renovation will include larger scoreboards but no final decisions have been made about how video will be used — a divisive issue between younger and older football fans. University officials assured loyalists that there will be no commercial signs or advertising. The current seating bowl also will not change. In contrast to Notre Dame’s approach towards preserving tradition, Texas A&M is also “upgrading” its own stadium — Kyle Field. However, A&M is taking a decidedly different approach to the use of video boards. On Tuesday, February 18, Texas A&M held a press conference in order to give updates on the Kyle Field renovation project, and the following is what was reported by the Dallas Morning News [emphasis added]. On Tuesday in at a press conference held by A&M to give updates to the redevelopment of Kyle Field, Texas A&M University System Chancellor John Sharp announced that the new video board that will be atop the new south endzone will be the largest in collegiate athletics. This entry was posted in Facility, Notre Dame by Travis Normand. Bookmark the permalink. It a phenomenal act to not sell out for branding dollars. Hats off to Notre Dame.